Police in Adelaide, Australia, are seeking an opportunistic thief after a giant inflatable clown was reported stolen. 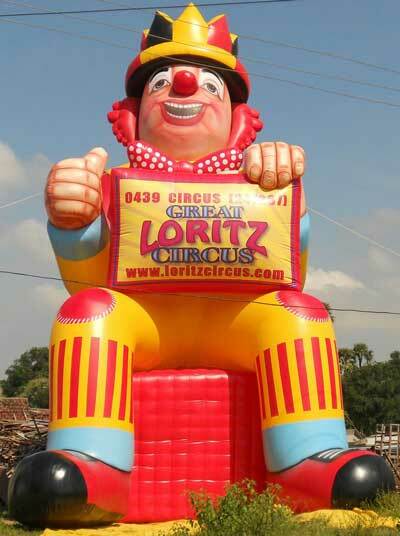 The inflatable clown, used to advertise the travelling Great Loritz Circus, was stolen in the brief moment it was left outside a service station in Old Reynella, at about midday on Friday. Circus spokeswoman Natasha Schulz said police had reviewed CCTV footage but the vision was too blurry to detect the numberplates of any vehicle in the area. Ms Schulz said the uninflated clown, which stands at 4m when erect, was not the first of the circus’ promotional clowns targeted by thieves or vandals. Ms Schulz said the thieves would be unlikely to be able to blow up the $3,000 clown because it requires a motor to inflate. “I know they might think it’s fun at the time but it’s not really because it is a valuable part of our advertising family and we would appreciate it back,” she said. Anyone with information about this incident, or the current location of the clown, is asked to call police. No. These thieves have performed a public service. There will be fewer nightmares now that this horror no longer terrorizes the populace. Thank you, brave pilferers, for saving us from this inflatable monster.